Immunity boosting diet: I joined Nutriwell after recommendation of My doctor for diet to boost my immunity. I was so worried, I couldn't understand what to do next. 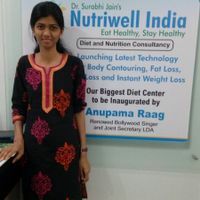 That's when I came across Dr Surabhi Jain's Nutriwell India. After meeting Dr Surabhi Jain I was totally satisfied that and convinced that I am in safe hands. She relieved all my worries instantly. She and her team guided me regarding the best food for boosting immunity and how can I maintain my health. I am totally happy and satisfied with the services I got. She gave me the diet and helped me regain my immunity. I feel a lot better and stronger now. Thanks a lot to team Nutriwell for that.